The investigation of mineral composition of interplanetary airless bodies is an issue of key importance for future utilization of outer space. It is essential in understanding the Solar System formation and evolution, assessing the hazard of asteroid impacts, and preparation for robotic and human space missions. CubeSats can potentially offer a cost-effective solution for extensive composition mapping of these objects around our Solar System. 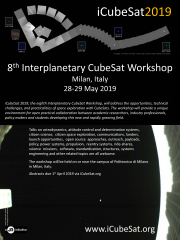 CubeSat mission concepts for remote sensing of asteroids and the Moon have been investigated. A novel CubeSat compatible spectral imager developed by VTT Technical Research Centre of Finland, is used as the primary payload for these missions. It is capable of imaging spectral data-cubes, where selectable wavelength bands are separated in the time domain. By selecting the wavelength bands according to the reflectance spectra of minerals under investigation, the composition of the object can be detected. Preliminary analysis of detectable minerals, required surface concentrations and used wavelengths has been performed. The proposed CubeSat designs are based on heritage from the Aalto-1 CubeSat, developed in Aalto University, demonstrating VTT’s spectral imager technology in orbit for the first time. According to our findings, all necessary CubeSat subsystems for realizing the missions are already available either in-house or from the market. However, issues still remain in accurate orbit determination, link budgets without the use of relay satellites, and radiation tolerance of COTS components. In this presentation, we describe the investigated mission concepts, spectral imager payload, preliminary CubeSat designs, and discuss the issues related to using CubeSats in interplanetary space as well as potential solutions to overcome them.